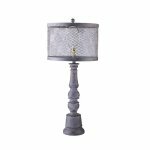 Our wholesale lamp collections offer a variety of modern to classic floor and table lamp styles. From traditional to contemporary, country to cottage, birds to horses, glass and metal, our wholesale lighting showrooms offer hundreds of designer lighting options! Many of our lamps and all of our mix and match lamp shades are made in the USA! Our retail lighting customers can enjoy an extensive selection of affordable, locally produced lamps. We are your lighting and home décor supplier providing bases, lamp shades and bulbs that will suit your store's look and customer's tastes. Discount wholesale lamps and shades can be found in Cathy's Corner.